A blaze in southwestern South Dakota killed one person and destroyed 20 homes Sunday, and hundreds of people have evacuated homes in the paths of fires in Nevada and Washington state. Residents of about 50 homes had fled the wildfire burning near Hot Springs that also had injured two firefighters, state and federal officials said. Roughly 8 square miles had burned since the fire started Saturday. The 8,000-acre wildfire in northern Nevada was threatening up to eight blocks of homes in the town of Winnemucca, about 170 miles east of Reno. "It's right up to the south edge of town," said U.S. Bureau of Land Management spokesman Jamie Thompson. "The fire definitely poses a danger to parts of the town." 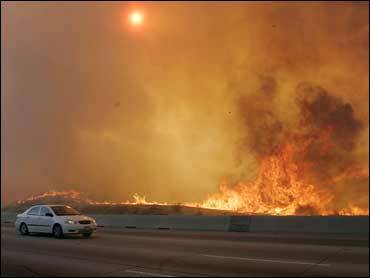 The Utah Highway Patrol on Sunday reopened a 100-mile stretch of Interstate 15 and 25 miles of I-70 that were closed when a 250-square-mile fire jumped the highways and filled the air with dense smoke. Police are warning people who are going to be on that stretch of Inerstate 15 to be extremely careful because a cold front is expected to shift winds and possibly send the fire right back over the freeway, reports Jennifer Stagg of CBS affiliate KUTV. Poor visibility was blamed for several accidents in Utah, including a motorcycle crash that killed two people. Other Western fires blackened the landscape in California, Colorado, Arizona, Idaho and Oregon. The largest Nevada fire had blackened 36 square miles, or 23,000 acres, along the Idaho state line, said Mike Brown, a spokesman for the U.S. Bureau of Land Management. It was 10 percent contained Saturday, officials said. Another fire blackened 11 square miles, or 7,000 acres, about five miles southwest of Carlin. It destroyed two mobile homes and several smaller structures, and closed a section of Interstate 80 for six hours during the night, fire information officer Tracie Winfrey said. The South Dakota wildfire grew overnight due to extreme fire behavior and erratic wind. South Dakota's firefighting resources were reduced Saturday when a single-engine air tanker crashed while fighting a fire on the Pine Ridge Indian Reservation. The pilot walked away from the wreck, according to the Northern Great Plains Joint Information Center. High wind in central Washington state during the night spread a brush fire that threatened homes outside Wenatchee. By Sunday morning, 250 to 270 homes had been evacuated and more were under alert. At least three outbuildings were destroyed. Fire officials estimated the blaze had covered 800 and 1,000 acres, said Jeri Freimuth, a fire information officer. The fire in central Utah had swept across parts of two counties, charring an estimated 160,000 acres, or 250 square miles, fire information officer LaCee Bartholomew said. "The fire laid down a little overnight, but it's still active," she said Sunday. "We don't have an accurate updated acreage, but it did grow." In California, more than 400 firefighters battled a blaze that had covered 17,000 acres of the 2 million-acre Inyo National Forest east of Yosemite National Park, forest spokeswoman Nancy Upham said Saturday. Firefighters were searching for and evacuating hikers on and near a popular trail to Mount Whitney, tallest peak in the lower 48 states. At least 200 people were evacuated from the small town of Independence, Calif., and a section of highway that runs along the eastern spine of the Sierra Nevada mountain range was closed, officials said. About two dozen people had fled two tiny northern Arizona communities Sunday as a blaze blackened 900 acres near Mormon Lake, southeast of Flagstaff. The communities, Long Park and Bear Park, have a combined 18 homes and summer cabins, said Coconino County Sheriff's Office spokesman Gerry Blair. Elsewhere on Sunday, a grass and forest fire near Michigan's Saugatuck Dunes State Park, along Lake Michigan, destroyed at least three homes and forced evacuation of about a dozen other homes for part of the morning, authorities said.